Weekend Edition Saturday, February 24, 2007 – Beginning this month, a team of seven explorers – including three Inuit hunters – are embarking on a 1,200-mile journey across Baffin Island in the Canadian Arctic. Traveling by dog sled, the expedition will spend time in local villages discussing the effects of Global Warming on Inuit cultures. A project of the Will Steger Foundation, the team will communicate with and educate online participants around the world. The project is sponsored by the Will Steger Foundation, dedicated to the exploraiton and preservation of the Arctic. The expedition has a very nice Web site. I’ve been following their blog for a couple months, and they finally set out this weekend. 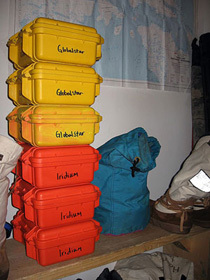 The blog (which is just sort of built into the static content but the feed is here) has been updated at least daily with nice, short posts about the logistics of the expedition, the people, the science and the cultural history. That’s going to be a lot of fun to follow their trip ? thanks for providing the link to their blog. I’ll be interested to know if they can get their GlobalStar satellite phones to work that far north. I used a GlobalStar on my trip to the Thelon, and was VERY happy with the service. At the time, Iridium had better coverage in the high arctic, but they were a company on the ropes, and their future prospects were not known. The competition is fierce in this market. Ultimately, they are competing for customers who work in busy urban places in the third world (and canyons of Manhattan) where cell phone coverage can be unreliable. But for us who travel in the North ? it’s a vital lifeline and provides a huge peace of mind on a remote wilderness trip. Many thanks. I am not sure … for such a large group, maybe they don’t want to share (ha, ha). The dogs have to get in their airtime too! For experienced trippers, a good backup plan and redundancy is the norm. A second concern, keeping the battery charged in sub-zero temperatures. They both use a lithium ion battery, which does pretty good in cold temperatures with little memory or loss of charge. But they are not flawless. There are also handheld GPS beacons which can be triggered in case of an emergency, and transmit coordinates to a centralized rescue agency for Canada or U.S. These are called PLBs (or Personal Locator Beacons). There were two mountain climbing accidents on Mount Hood this winter. The first group did not have a PLB and perished. The second group did, and were easily found and rescued. Another important communication and safety aid for people traveling in remote areas.